Use of greenery and natural materials, or of bright colours and shapes not normally seen in the city, to generate surprise, curiosity, and a sense of alienation and encourage us to get our noses out of our electronics to smile and interact with other passers-by. Three projects in three very different cities and settings, all sharing the common goal of improving people’s experience of the city and reconstructing social life and opportunities for interaction, even among strangers. 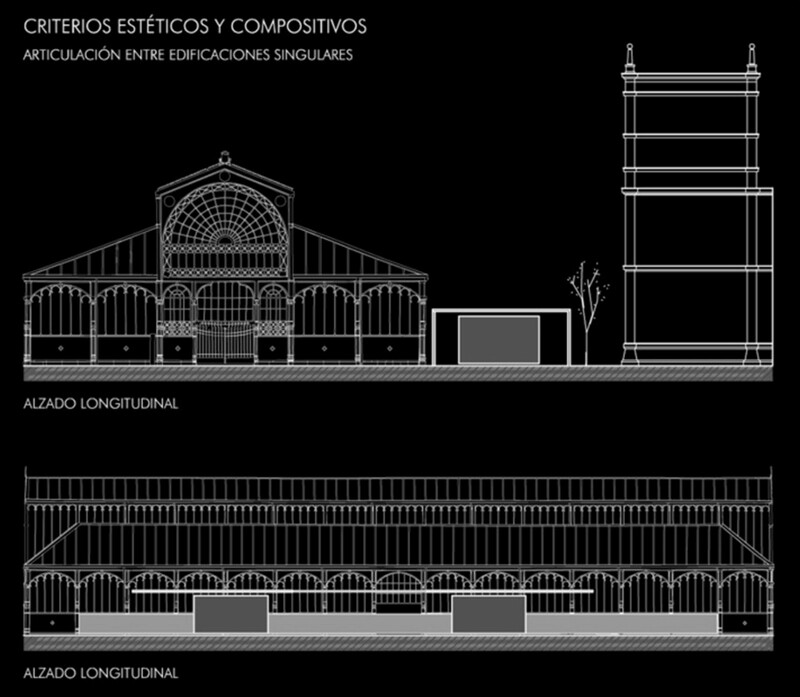 Ricardo Carracedo Castro’s project redevelops the city market area in Palencia. While maintaining the original structure, built in 1889, the architect wanted to give new vitality to a part of the city that had lost its importance due to the opening of new, more impersonal shopping areas. The project transforms the existing urban fabric, creating a series of areas clearly intended for different functions but all contained under a single shared roof, defined by a number of structures, such as two small glass kiosks, and by the modular elements of the vertical garden reconstructing the southeast façade of the original building. This solution makes it easy to distinguish the new addition from the historic building and adapts the old façade in response to today’s standards of insulation and sustainability using a flexible modular element that can also be repeated in different contexts. Espaço is a versatile, colourful multi-purpose platform made up of modular elements and designed by the Italian studio Piuarch in partnership with architect Duda Mitidiero and landscape architect Cornelius Gavril. The project was built for Expo Revestir, South America’s biggest trade fair, an event with a focus on architecture and construction. The prototype built for the trade fair event was donated to the school in the CEU circuit constructed in the favelas of Paraisópolis for use in the schoolyard. The platform consists of recycled plastic base elements juxtaposed and repeated to suit requirements; they can be used as benches, planters, tables or totems. Similar modules which are not extruded but made of rubber are used in the flooring. It is all based on a geometric shape in bright colours, fuchsia and orange, forming a highly visible urban landmark. A modular system which can be infinitely expanded over time, integrated with tables and bookshelves, and used in different ways by the community: as a playing field, a place of learning, a little theatre, or just a place to rest and wait. 100architects is a studio specialising in the design of urban installations that attract and involve people of all ages. Only a few months ago we presented the Red Planet project, also in Shanghai, a surreal red planet that gets adults and children alike involved in recreational and sports activities. The new installation, also built in Shanghai, for a summer event on a private shopping street, is called Triangle Tango and, as the name suggests, it is based on lights and music. So as not to cut down on the visibility of the shop windows, the architects designed an interactive installation that rises out of the ground and produces lights and sounds under the pressure of footsteps. The installation transforms what used to be a passageway people wanted to get across quickly into a space where they want to stop and interact. Bright colours and animation that starts automatically if people don’t interact with it generate a surprise factor, inviting passers-by to stop and “play”.